The seven keys to creation were developed over the past 35 years of writing music, poetry and other works. I believe I have come to know through self inflection and study just exactly what it takes for anyone to create something. What is it that enables you to move an idea into a physical expression rather than keeping these creative ideas inside your head? I’ll try to explain. Before we discuss the seven keys to creation, let me first start out by saying that what I believe is not being thrown at you with the intent of telling you to believe as I do. I would never do that. This is merely a paper that explains what it is I know to be true for me. If you find a piece of information valuable to you then I have reached my goal. If you have found this entertaining, then again, I have reached my goal. A Process – I believe that creation and the process of creation, in and of its basic nature and character, is generated deep within a persons psyche. It is a process not an event. It is an intangible part of who we are. It is an innate human characteristic delegated only to the human species. It is also the challenge of every person to first identify those facts, but further, to be curious enough to begin the journey of learning how to tap into one’s ability to create at conscious will or by choice if you prefer it stated that way. In other words, you must be willing to walk the path of a creator. The second point I want to make is that you must be willing to learn. Over time and resulting from my interactions with others, as well as myself, I have learned that if a person thinks there is nothing more to learn then they usually don’t learn anything new and thus limit their ability to create. They go about life doing things from a base of limited knowledge and limited design only moving through and living a life by those things they actually do know without seeking further knowledge or study that would help them improve their station in life. If this is you then you might as well stop reading. For all of the others who wish to learn more about creation, I would suggest that you either; continue reading this series of articles or find some other successful and creative person, model their creative skills and install those skills within yourself. Either way you will learn more about creation and about yourself. Thoughts as things – Further, I believe that thought is a thing. It is tied to everything else throughout the entire universe. It can cause or have an effect on everything and it is in the character and the quality of persons thought that their life manifests. As the old saying goes and it still applies, “garbage in, garbage out.” There is nothing in this physical world that exists and that has not been a thought, at least at some point, always in the beginning. Think about it for a second, if Henry Ford didn’t think about making an automobile there would not be any Ford automobiles on this planet, other brands of cars maybe, but no Fords. If thoughts were not things then what makes you get up out of bed in the morning, responsibility of some sort? Isn’t that just a thought whether you chose or not chose to accept that responsibility? Upon acceptance of the idea of responsibility, that thought became a thing. My apology if this sounds too direct. I will not belabor the point further. The seven keys to creation could not have been made manifest without first having been thought about. Clearing the table – Also, you must be able to clear the table. By that I mean clear your thinking. You must be able to or have the means to control the outside sensory input and influences, the external “noise” as well as your internal dialog(s) in order to focus on the acts involved in the process of creation. This can be mighty challenging in so far as the world is somewhat demanding of our externally focused attention. Sometimes the stress level of your day is keeping your own mind in hyper drive. We must learn to slow down, take five or be able to stop our thinking just long enough to redirect it towards creating something new. On a regular basis, it is important for me to sit quietly for a few moments to clear my mind of the immediate things I am paying conscious attention to; my bills, my job, my to-do list, etc. This is not to say that these things are neglected or permanently set aside, only that they are temporarily put on hold until I am ready to reactivate my thinking upon them. It’s sort of a mental game for me now, almost like taking a vacation whenever the urge strikes me to begin to create anything new. A word about inspiration – When writing music, sometimes the act of creation begins with a simple cognitive idea or thought where I use devices learned and gained through the study of music composition for example. These things are the basic tools of the trade. Such things as; selecting a tempo, a key signature, a time signature, a chord progression, etc. where the creative process begins with a sketch or outline of what it is I wish to convey to the listener or simply what I have chosen to create. At other times, without warning or advanced notice, I “hear” a series of notes or a motif that begins the process of creating. By the time I get to a pen and pad the music is already unfolding and all I need to do is simply write it down. I know that sounds odd but have you ever had an idea that you believed was unique? Did you draw or sketch it out on a napkin or a piece of paper? Much the same I would suppose. Another word about inspiration – Musical ideas and inspiration can come from an incredible array of sources if you are listening or sorting for them. Walking down the street you hear the rhythm of your walk as your feet hit the sidewalk, the birds singing in the trees, the wind as it passes your ear, the sounds made by an automobile engine as it idles at a stop light, the voices of people around you. These sounds are not as subtle as you would think if you would take minute to listen. Somewhere in all that sound is a song. It is a composers job to listen long enough and intently enough to find it, catch it and write it down. Another source for inspiration is my internal emotions and/or my observations of others and the emotions conjured up during normal human interactions. It is being sensitive to life in general. In my thinking and making observances of the world around and about me, I attempt to internalize them and permit them to awaken me in whatever fashion they may. Things that seem important sometimes are not. Things no one else would think important may become so important, as to stir some emotion in me that I have to create. It’s almost like I have to breathe. It is from these emotions that musical ideas flow. Again, it is my job to write them down. Desire – There are several key personality characteristics that help a person to create, one of them is desire. However, if a person has no desire to create then they will not, at least consciously. Before we discuss the first key to the seven keys to creation we must look at this thing called desire. Desire is the one things that must reside in a person if that person wants to create something. Desire is caused by either a lack of something or someone, a wish to have something or someone or the desire for changing ones current circumstances. It is born out of personal intellect, reason and inference. It is also emotional. It is at times intense and urgent. It is one of the many and basic personality characteristics inside everyone that is alive. However, creating goes beyond this characteristic in so far as once a need or a wish arises, a creative person activates the imagination with the intent of replacing or making new something that has never existed before. Imagination – Imagination is a key and critical component of the seven keys to creation. Without implementing imagination in our thinking, there is no possible way to intermingle ideas, to generate a new idea or to ponder enough about the new idea as to cause you to be excited and enthusiastic enough to create it. There is no system other than the imagination that will permit original thought. There is no reason, cause or purpose, including mental or emotional activity that can be employed to take parts from many ideas, co-mingle them and make an entirely new thought that is specific and unique to you, other than through the use of your imagination. There is no way to change or alter an existing thing in such a way as to service optimally and to fulfill a desire more easily than through the use of your imagination. As a child plays with their toys, he or she exercises their imagination all of the time. They make things up by gosh! Now how amazing is that? The problem is as we get older and more enthralled in our daily lives we have forgotten how to make things up, how to create things that become the object of our desires strictly through the use of our will. I try to exercise my imagination every chance I can to keep me well oiled in the processes of imagination. Daydreaming, wishing, hoping and anticipating are all exercises we can use to explore our own imagination. We then must learn or remember that we can use this tool to assist us within the processes we use to create something. The secret of success has been written about ever since I can remember. What was always missing was a package or collection of information that led me to be effective at creating new things and ideas. The foregoing was a setup of sorts for explaining what I have found to be an addition to the study of successful behavior and choices. The following are the seven keys to creation. The First Key – The first of the seven keys to creation is to know what you want to create. Simply knowing what it is you want to create is not enough though. You must define, as specifically as possible, the object of your desire. I also believe that having some type of an educational foundation will improve the ability to create better products, things or ideas. The higher the education level coupled with a crystal clear idea of what you want to create, the more superior the final product will be. It is through education that we define the object or objects of our desire in more complete detail. Without that basic foundation there can be no serious creation arising from any effort made, except for maybe chaos or a low quality product. 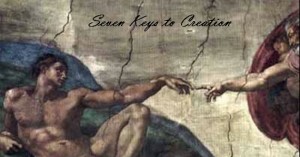 There is already enough of that so let’s move on quickly to the next key to the seven keys to creation. Do what you do the best and do it often. The Second Key – A person has to possess enough desire to make the object of their desire, real. It takes power and energy to bring something into this world. If it is your dream, it is up to you to find that power and energy or to tap into the Universal Energy to assist you on your journey through to the manifestation of your dream. A person must have the desire to create, arising from their inner self, in their chosen field, on any level, in order to do so. Tell me really, do you listen to anyone else but yourself? You may listen but do you follow their suggestion or do you assimilate and learn from others only to make your own decisions from the gathered information? Most people will gather information from others and then come to their own conclusions, weighing all available information relative to the object being created. Some people listen and take direct action on others inputs without considering what impact the information may or may not have. Some people do not listen to others at all and they create their life according to their own knowledge at any given time and on their own terms. The questions are; is the new information relative to the thing or idea you wish to create? The second question is; in what way or ways will this new information affect my desired outcome? The next question is; can I accept the new information and assimilate that data into my preexisting information to create the object of my desire? Two additional questions are; what additional resources are needed if I adopt this new information into my plan for creating the object of my desire and does or will this new information empower me? Before you can answer those questions it is important to know what it is you wish to create. In the process of knowing you must define it clearly succinctly and thoroughly. The higher the level of creation you wish to employ the clearer your definition of the object of your desire. Remember, the definition is critical and it must be in place before you move into action. It is in the act of defining our desire that we energize ourselves with enough power and excitement, as well as hopeful anticipation, that we become enabled with great enthusiasm to take action. Here again, some people have access to this as an innate part of their character while others must develop their internal desire to do the complete act of creation or to move them forward through the entire process of creation. They must nurture and feed the small seeds of desire within themselves in order to raise the level of desire to that needed that will enable a person to generate something new and different, different than anything ever devised or created before. I want to make another point here about desire. You can be thirsty and get up from your chair and fetch a glass of water. This is one level of desire. To be in a desert for three days without water produces a level of desire far beyond that of simple thirst. It becomes a craving for water instead. The higher the level of desire the more energy there is available to complete the challenges involved in the physical side of creating something. Without desire nothing happens except the idea itself. Without the level of desire described above nothing great happens. In some cases the thought never makes it out of the mental stage of creation, at least through or by you. In essence, if you tie together the object of your desire with your fire of desire you will be on your way to creating the very object of your desires. Desire is then the second of the seven keys to creation. In the end, the character, quality and satisfaction you will receive from your creations are directly tied to your ability to define what it is you are attempting to create. The Third Key – The third key to the seven keys to creation is to have the ability to generate new ideas, caused either by outside influence or your own internal mental drive and they must generate a higher level of desire than simply through that level of emotion created by the basic thought of simply wanting to create something out of nothing. You must be able to do this on an as needed basis. It is likely, as you move through the process of creation, that you will encounter roadblocks and other obstacles preventing you from moving forward. You must be creative enough to overcome them along your pathway to manifesting your desires. You may encounter only one or two “issues” preventing the completion of the creative process or many. So, to assure your success you must be ready and able to change your actions so as to make this possible. In other words, you must be flexible and adaptive to yourself and your environment as you proceed along the path of creation as you apply the seven keys to creation in your own life. There’s something else to learn about huffing and puffing and blowing your straw house down. That is, an earthquake will tumble your stone house in just a few seconds. Rigidity can be an asset, but it can also be a weakness. For this reason you must remain flexible as you progress through the process of creation. The Fourth Key – We are all to one degree or another social creatures. We live with and around other people even if they are family, a friend or two and our coworkers. We dine with others, we work with others, we play with others in our sports, etc. Nothing worthwhile and sustaining can be done alone. You must cultivate an ability to work well with others on your way to fulfilling your desires. Are you a master at each task? Can you perform every act with no other party participating? Can you complete every step of the creative process without any one else being involved? If your answers are yes, then you will have the results you seek manifest through your own actions. If the answer is no then you will need to seek out and secure the help of others. Most businesses require the use of people skills and in most creations, it will be necessary to use your acquired and learned people skills in order to succeed. Social interaction in various forms is the fourth key of the seven keys to creation. The Fifth Key – Action! Nothing can be accomplished without some type or form of action. You can have the most incredible dream or desire. One that would be the envy of the world, but without taking any action on that dream your hopes for achieving it are ill founded. The fifth key of the seven keys to creations is action. For without action no thing can be accomplished. The definition of your hearts desire must be so inspiring that it demands of you nothing short of action, but you must remember that you can lay out the most detailed plan but nothing happens until you take that first step. Also, all of that planning you put in to making your dreams come true, works well at first and it flies out the window at the very next step when the unforeseen detour requires you to make a complete rewrite of the script of your life, demanding even more action. It’s not the hardest thing to keep going though, it’s actually getting started! I remember standing in front of a long bed of hot coals one night in Palm Springs California. I still do not know how I got there, at the front of the line that is. What I did know was there were several hundred people waiting for me to take my turn at this event. I had to take that first step. It was there that I learned the difficulty of overcoming internal dialog preventing me from achieving my goals. It was there in that moment that I learned about overcoming fear, actually dread. It was there that I gained the understanding about one fact, you either, go for it or you retreat into a pile of self defeated rubble. The results of all those lessons were that I knew directly that nothing happens until you take action. Thank you Tony Robbins! The Sixth Key – The sixth key of the seven keys to creation is persistence. Persist until… I heard a story once about a gold miner who purchased the mining rights to a piece of property at the age of thirty two. With great enthusiasm he searched for that one vein of gold in hopes of retiring still a young man. He continued on digging here and digging there for ten years. In fact the land was riddled with holes about 75 feet deep. He became frustrated and in his 15th year of mining for he decided to stop and find another place to find his treasure. His mind was telling him what a failure he had become and he felt as though at 47 years of age that he had wasted the last 15 years of his life. Now what was he to do? After a short time of pondering his apparent losses and when he had reached his limit, finally he decided to sell the mining rights he had acquired on this land. He had somewhat of a difficult time selling the mining rights until one day another 30 year old young man came by and purchased the dream he had once had. The second man began to think about where he should start to dig and then one night in a dream he had an idea. In the morning when he arose, he went over to the place he recognized from his dream. The place was already dug to 75 feet deep with no luck by the previous owner, but he knew he needed to start right there. Just six inches below he discovered a huge vein of gold valued at over $500,000,000 dollars. If only the first man would have dug six inches deeper…. The Seventh Key – You must have faith in yourself and the Universe. So sayeth the seventh key of the seven keys to creation. You must have faith in your God. You must have faith in yourself for without any of these it will be a difficult road to walk. I ask you now, what man or woman alive today has not, at one point or another in their lives, knelt to pray to their God? What else or who else can you turn to that has the ability to and is willing to help you in those moments other than God? One thing I have noticed is that people find it easier to have faith in others and in their God more than they have with themselves. If there was any one thing most difficult to overcome it is self doubt leading to a lack of or a limited faith in the self. I am not talking about some egotistical and totally self focused individual here. I’m talking about you, the average person. The world has a way of beating a person down and in so doing can affect and impose a negative personal view onto ones self. To limit the internal chatter helps but sometimes it takes more than that. Yes, you can ignore the problems at your feet. Yes, you can live in denial of the truth. Yes, you can choose to have a negative reaction to the world about you, but what will keep you going when the going gets really tough? What will pick you up one more time when you stumble or fall? By whom and by what power will you keep going no matter what? These are indeed difficult questions to answer and I cannot give you your answer. You must find that yourself. It must come from inside yourself. The knowledge will be known to you when you actually experience it and likely only then unless you have developed the ability to believe, without restriction, in yourself. I am not an overtly expressive person when it comes to faith as I feel my faith is totally my own and totally personal. When I’ve been beaten down here’s what I do. I kneel and pray for guidance to my Creator, God. Conclusion – The Seven Keys to Creation concludes with this comment – This is the first of a series of articles about creation. The second part is about the steps to creation followed by breaking down each step into smaller bites enabling anyone to know and understand how to create anything. The last segment is about the limiting factors preventing creation. All in all I hope to provide a broad discourse on the subject of creation. Hope you will find value in it. The seven keys to creation provides a road map of sorts which enables you to move beyond your self imposed limitations or those limitations imposed by others. I would challenge anyone who would deny the seven keys of creation play any role in actually creating anything. In fact, I would venture to say that they would need to use these seven keys in order to propose their denial. Anything of any importance requires the use of one or all of the seven keys to creation in order to make it happen or to make something out of nothing. After your review of this article I believe you will have the foundation to move forward on your project and that the seven keys to creation are indeed needed in order to manifest ideas into reality. Happy creating!